My friend Ali (yes, she spells her name the same way as me!) 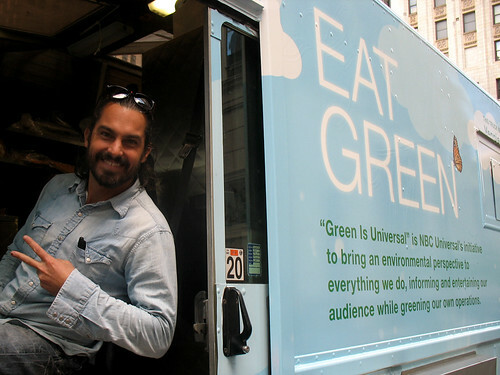 alerted me to the news that the Green Truck is giving out FREE veggie burgers all week – to promote NBC/Universal’s “Green Week". Free veggie burgers? Dream come true! I had heard of the Green Truck before (it’s based out of LA, but comes to NYC and other areas for special occasions), but always missed the chance to try it when it was in town… until now! Despite the fact that I am still getting over a cold, and finally had a day off again so I could have stayed in bed... I braved the extremely windy weather and caught up to the truck this afternoon when it was parked downtown on Barclay St. and Church St. They were closing up the truck in preparation for a move to its next location (it's traveling all around Manhattan this week, parking in several different locations each day), but Mitchell was awesome enough to introduce himself, give me a freshly-made burger, and chat about the truck before they left. This is their “Mother Trucker Vegan Burger” – totally vegan, and they make the patties themselves! It was delicious – much better than you would expect from a free burger served out of a food truck (I know the food truck craze has come a long way in changing the quality of such food, but veggie burgers seem to have gotten left behind in this revolution… until now, that is). 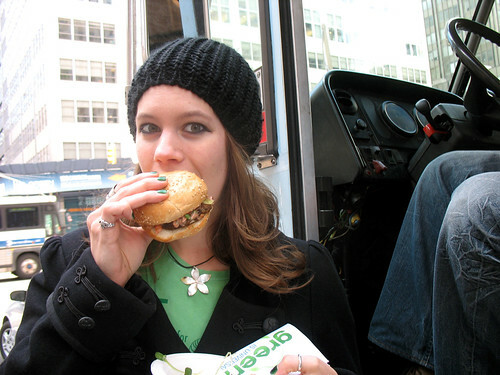 another custumer, who heard about the truck on Twitter, models the burger's insides for my camera. Topped with onions, peppers, tomatos, and the most amazing sauce... I am still thinking about how good that sauce was, hours later. 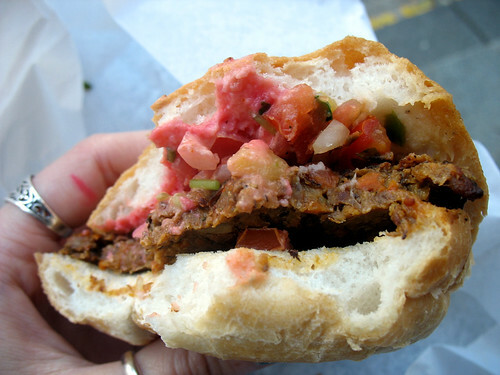 And the patty was perfect – rich and spicy, soft and kind of melt-in-your-mouth-good. Mitchell told me that it’s made with heirloom carrots and shiitake mushrooms, among other ingredients (and you know I’m the girl who can’t stand mushrooms – but trust me, they are blended in with all the other flavors so well they did not affect how much I enjoyed the taste of this burger!) It was really just the right flavor for a veggie burger: so hearty and satisfying that you only notice how much you are enjoying it - not the fact that it's a vegetarian version of a traditionally meat-based food. I bet a lot of meat-eaters would enjoy it, too. I hope the fact that it's free will entice a lot of them to try a vegetarian lunch, even if they wouldn't otherwise! me, enjoying my free burger! My only complaint (can you even complain when the food was free? 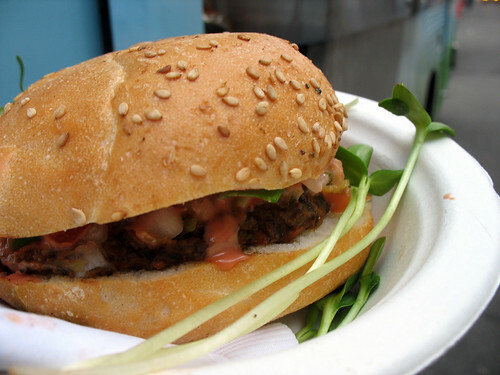 Well, yes – if your blog is all about veggie burgers) was that the bun was a little oversized and thick for the patty and toppings – the last few bites of the burger were all bun, not as tasty as when it was in perfect harmony with the insides. 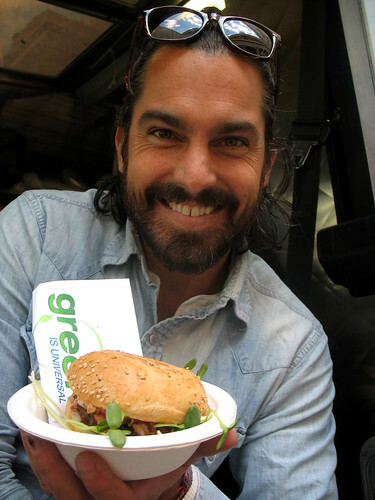 But Mitchell told me they are considering trying a spelt bun for the burger in the future, so maybe that would be a better match. Still, I can’t stress enough how tasty this burger was! 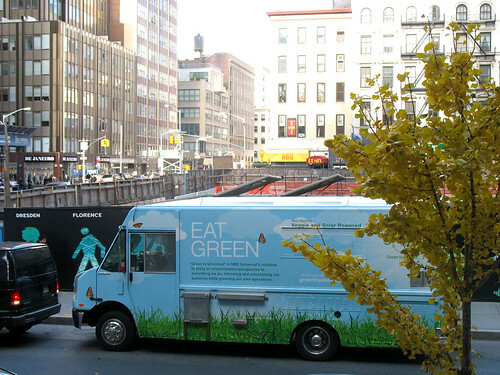 If you live in NYC then tomorrow or Friday you should definitely check out the Green Truck’s twitter feed to see where they are, and grab a free burger for yourself while they are in town! 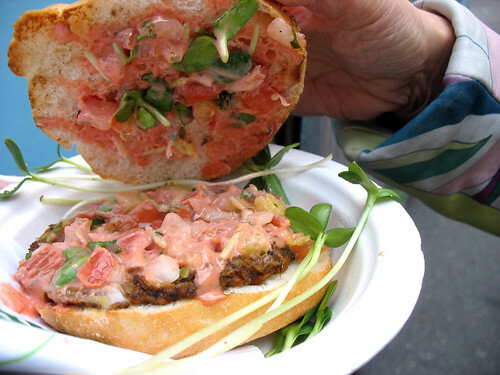 How often do you get the chance to eat free, amazing-tasting, vegan food in Manhattan, afterall? currently traveling around Manhattan this week, check their twitter feed to see where they are. omg I am so going tomorrow! Thank you!